Governor Simon Lalong of Plateau State on Wednesday challenged people of voting age in his village, Ajikamai, East of Shendam Local Government headquarters not to miss the ongoing Local Government elections in the state. 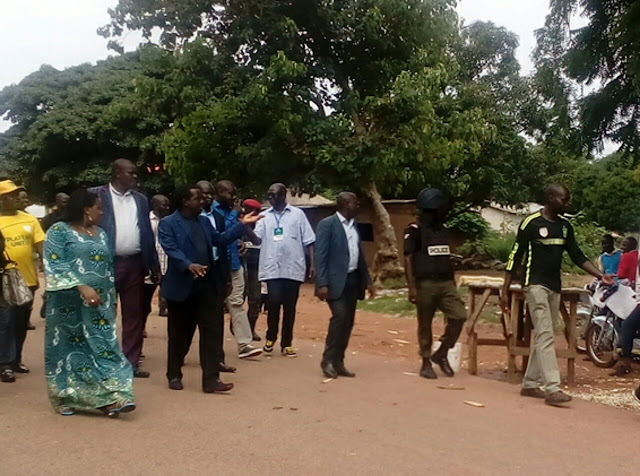 Lalong who met with the voters one-on-one as he and his wife took a walk across a major street in the village encouraged them to always take part in the selection of their leaders. The Governor after casting his vote at his polling unit located in Government Secondary School Ajikamai equally encouraged a group of welcoming children to always vote when they attain the right age. He had told journalists after casting his vote that he was impressed with the turnout and peaceful conduct of voters at the polling unit, expressing hope for positive outcomes after the polls. MKB however witnessed instances of chaos in the polling unit when some voters attempted preventing others from voting for opposition parties. It was however observed that result sheets were still plain while voting was on. This was against an earlier insinuation by the opposition Peoples Democratic Party (PDP) that result had been scripted and passed to election officials. There were nevertheless other polling units like Longvel 1 and 2, where result sheets were still being expected. Some opposition advocates had raised similar fears that result sheets were still to arrive some polling centres, suspecting plots to deploy already scripted results after the polls. Similarly, onetime Plateau State House of Assembly Speaker and PDP Gubernatorial aspirant, George Daika had raised concerns over "vote buying" in his polling unit in Pyapun village which he shares with the Mikang LGA caretaker Chairman, Boniface Gwotbit. MKB cannot confirm this but some APC officials including the Chairmanship running mate of the party for Shendam LGA, Williams Tiplong were thought to be secretly engaged in malpractices in a secured classroom in a school in Longvel village where voting was taking place. Mr. Tiplong had confidently claimed the ruling APC was going to " carry the day". The caretaker Chairman of Mikang LGA, Hon. Boniface Gwotbit had equally expressed confidence that the party's chances were bright.